The Alentejo is a magical, little-known region of Portugal set between the Algarve and Lisbon. With historical hilltop towns, delicious regional cuisine, excellent wines and olive oil, a long, pristine and undeveloped coastline, protected National Parks, rural villages and cork forests to enjoy – the Alentejo might well be called the Tuscany of Portugal. This is our suggested itinerary with places to visit, but as car hire is included you are quite free to explore as you like. Arrive at Lisbon airport, collect your hire car and drive (c.75-minutes) to the 5-star Convento do Espinheiro Hotel in Evora. Enjoy a complimentary historical guided tour of this unique property and, in the evening, a three-course dinner (excluding drinks). The hotel was home to generations of Portuguese royalty and is located in countryside close to the royal town of Evora. The Convento do Espinheiro is the perfect choice for a short break offering culture, exploration, food and wine, total relaxation, exercise in the pool or gym, spa treatments or, indeed, all of these many options. Overnight at the Convento do Espinheiro Hotel, Alto Alentejo (interior). Take the opportunity to explore the fascinating medieval walled town of Evora. Use the complimentary hotel transfers from/to the centre, to avoid the hassle of parking. The UNESCO World Heritage Site of Evora, with its palaces and marble buildings, is a must for any visitor. Evora is the oldest town in Portugal - with 22 churches and beautiful religious architecture. You will notice architecture characterised by a twisted rope decoration, called Manueline, which is Portuguese late Gothic style and dates back to the 1500s. Marble doors and window frames are common in the area due to the plentiful supply of marble. A visit to the somewhat macabre Bones Chapel (Capela dos Ossos) is a must for any visitor. This Franciscan Chapel has walls that are literally covered with human bones, including skulls, removed from tombs by monks. Return to the hotel and enjoy a well deserved visit to the spa and enjoy a complimentary ESPA Aromatherapy massage (30-minutes). 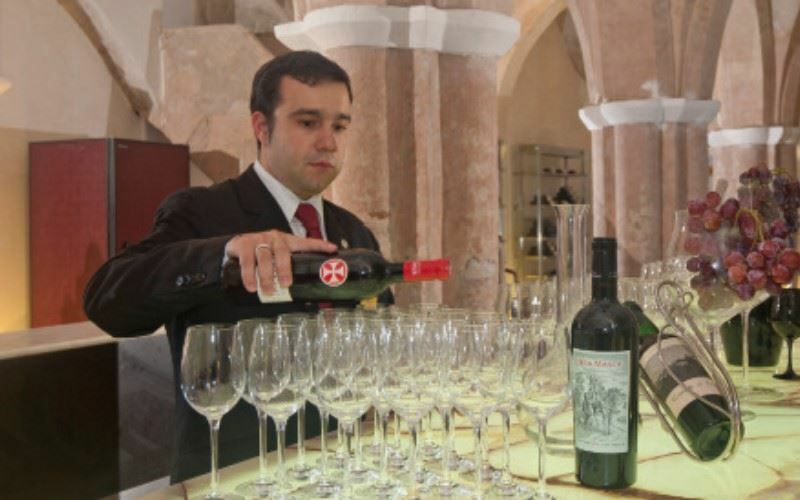 End the evening with a complimentary wine tasting in the hotel’s spectacular vaulted cellar. Drive to the royal town of Estremoz (c.1 hour drive). Visit the hilltop castle and the fortified walls, the churches and the pretty little streets with shops selling local products. Then head to the nearby hillside winery, Encostaz de Estremoz, from where Estremoz can be clearly seen. Enjoy a sumptuous lunch or dinner (not included) in the winery’s restaurant which has floor-to-ceiling windows allowing a fabulous view of the sun setting magnificently over the vineyards. On your return visit Evoramonte (c.15-minutes), located between Estremoz and Evora, a medieval village with tiny, peaceful streets surrounding the castle. Linger there and be overwhelmed by the beautiful views from the top of the tower. Head west towards the Spanish border and the charming village of Monsaraz (c.1 hour). This pretty hilltop town offers some fabulous views over fields, vineyards and the Alqueva Lake – the largest artificial lake in Europe (c.96km long). There is a medieval castle, cobbled streets and white-washed houses. After lunch, drive north to Vila Viçosa (c.70-minutes), where the Royal family of Bragança lived, with its impressive Palacio Ducal and Palace Square. On your return to the hotel why not make the most of the complimentary spa/health club facilities including indoor and outdoor pools. Drive to Lisbon airport for your flight home. After breakfast, head south to the town of Beja (c.75-minutes). The city has a number of interesting buildings: The Convento da Nossa Senhora da Conceição, dating from 1459, enjoys international fame from the 1669 French publication of the celebrated ‘Lettres Portugaises’ (Portuguese Letters). These were five lyric love letters by a 26 year-old nun named Mariana Alcoforado to her lover the Comte de Saint-Léger after he deserted her; It also houses the Museu Regional da Rainha Dona Leonor containing many items that reflect the various cultures that have influenced the region since Pre-Historic times. As you approach the city you cannot fail to notice the 13th century Torre de Menagem, the keep of the original castle built by Dom Dinis. The impressive tower stands 36 metres high and has an interior staircase of 183 steps that may be climbed. Try the specialty of the town, the delicious ‘Pão de Rala’ bread-cake made with pumpkin. The property is a national monument and one of the most famous monasteries in Portugal. The property is a national monument and one of the most famous monasteries in Portugal. Legend has it that there was an apparition of the Virgin Mary, above a thorn bush (espinheiro) in the early 1400s. By 1458 the site had become a centre of pilgrimage and a church and monastery had been built. Now a luxury hotel and Spa, the hotel is set in 20 acres of herb gardens, olive groves and vineyards and has been sensitively renovated to reflect the majesty and splendour of the original building.